In this paper, we propose a general technique for removing symmetries in CSPs during search. The idea is to record no-goods, during the exploration of the search tree, whose symmetric counterpart (if any) should be removed. The no-good, called Global Cut Seed (GCS), is used to generate Symmetry Removal Cuts (SRCs), i.e., constraints that are dynamically generated during search and hold in the entire search tree. The propagation of SRCs removes symmetric configurations with respect to already visited states. We present a general, correct and complete filtering algorithm for SRCs. The main advantages of the proposed approach are that it is not intrusive in the problem-dependent search strategy, treats symmetries in an additive way since GCSs are symmetry independent, and enables to write filtering algorithms which handle families of symmetries together. Finally, we show that many relevant previous approaches can be seen as special cases of our framework. F. Bacchus. A uniform view of backtracking. In Unpublished manuscript, 2000. http://www.cs.toronto.edu/~fbacchus/on-line. F. Focacci. 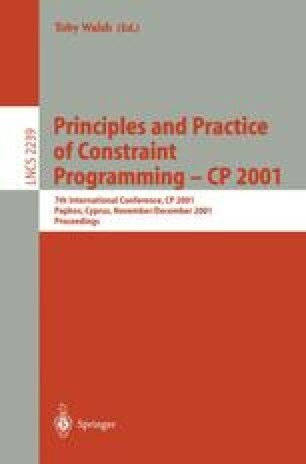 Solving Combinatorial Optimization Problems in Constraint Programming. PhD thesis, Fac. Ingegneria, Universita’ di Ferrara, Italy, 2001. http://www-lia.deis.unibo.it/Research/TechReport/lia01005.zip.